and you laughed and laughed and laughed. you laughed at my walk. you laughed at my inside. You laughed and laughed and laughed. froze your eyes and froze your tongue. know not cars, know not ice-blocks. 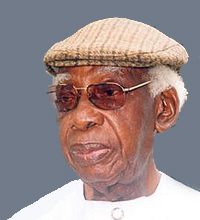 Gabriel jibaba Okara (born 24 April 1921)is a Nigerian poet and novelist who was born in Bomoundi in State, Nigeria. In 1979, he was awarded the Commonwealth Poetry Prize. This well-known poem by Okara is sometimes wrongly attributed to Dennis Brutus.